in an exceedingly giant stock pot, add shredded onion, carrots, and celery at the side of a pair of Tablespoons oil. Saute for five minutes over medium heat. Add minced garlic and saute for two minutes. Add diced chicken, broth, and dry alimentary paste. Bring soup to a boil and simmer for 15-20 minutes or till the chicken and alimentary paste is totally stewed. take away from heat. Add in juice and parsley. Serve hot. 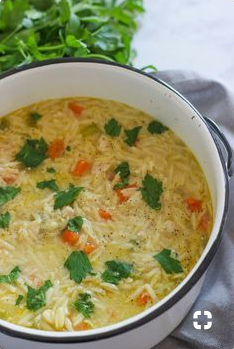 0 Response to "One Pot Chicken Orzo Soup"